Apparel producers across Asia may face a more than 5% minimum wage increase in 2016, according to an industry source. 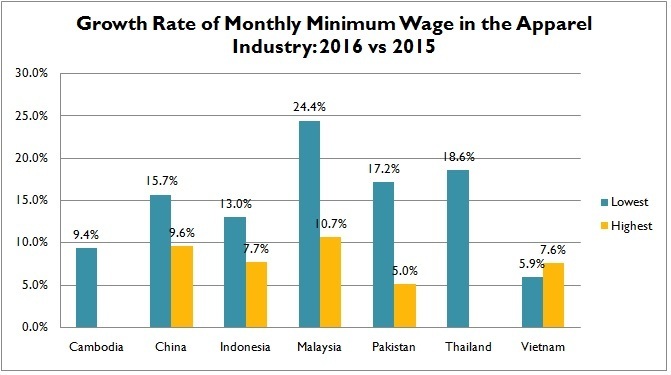 India, Malaysia, Thailand and Pakistan may see the biggest increase of minimum wage (up more than 15%) among the leading Asian apparel producers, whereas minimum wage in Bangladesh and Philippine may remain roughly unchanged from last year. As noted by the industry source, this year’s minimum wage increase comes from various reasons. In Cambodia, the increase is mostly pushed by local labor unions. Indonesian government raises the wage aiming to shorten the gap between minimum and living wage in under-developed regions. Additionally, countries such as India adjust their minimum wages more based on economic factors such as inflation rate, GDP growth rate and consumers’ price index. 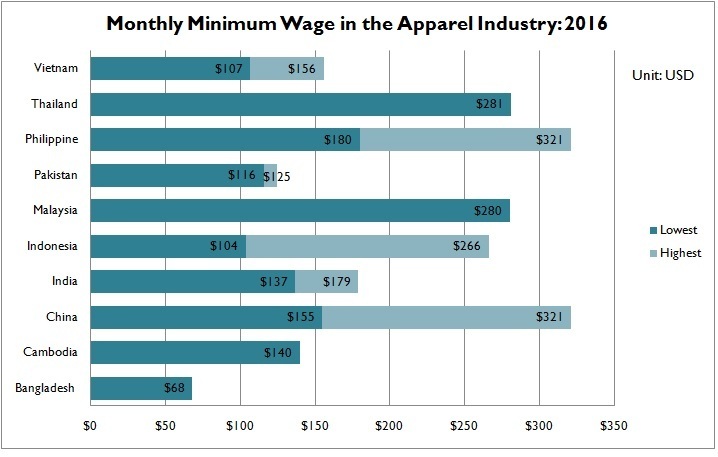 Data further shows that the gap in minimum wage between Asian apparel producers somehow is widening. For example, monthly minimum wage in some parts of China has reached $321 USD in 2016, which is $253 USD higher than in Bangladesh ($68 USD/month), up from $225 USD in 2015. A wide gap in minimum wage is also found within some Asian countries. For example, in Philippine, Indonesia and China, the highest minimum wage could be almost twice as high as the lowest minimum wage in the country. Despite the increase, minimum wage in Asia remains a fraction of the level in the developed countries. For example, minimum wage in the United States was $7.5/hour in 2015, meaning a worker’s monthly minimum wage shall no less than $1,200 (assume working 40 hours/week, 4 weeks/month). Pingback: H&M Conscious fashion - to shop or flop? Why are there different minimum wages in different parts of the same country, especially when the manufacturing industry is so important to the economy of the country? It says that in places like China and Indonesia, some minimum wages could be almost twice as much as the minimum in other parts of the country. Who is regulating this if there is such a large gap? It also compares the US minimum wage with these foreign countries. We talk in class about how we outsource our labor to foreign countries because the labor is so cheap, especially in comparison to the US. In the US, the minimum monthly wage should be around $1200 while only around $300 in countries like China. Why are the policies about minimum wage in the same country so different from the US? I feel it should be equal across one country and fair to the workers. The labor will obviously stay cheaper overseas, but it is not fair to the workers. Which areas in those countries get more labor sourced from the US? Is it those who live in the lower minimum wages due to the lower wage, or those who do live in areas where the minimum wage is higher? these are great questions. personal views: 1) because of the stage of economic development, it is not unusual to see minimum wage varies from region to region in a country. For example, in the U.S. hourly minimum wage ranges from $7.5 to $11.5 as of Jan 1 2016 (https://www.fas.org/sgp/crs/misc/R43792.pdf ) 2) second, although minimum wage is much lower in the developing countries, it is not necessarily “unfair”. Wage reflects the relationship of demand and supply in the labor market. Developing countries have relatively abundant supply of cheap labor, therefore the wage level is lower. This is also why developing countries usually have comparative advantage in labor intensive industries. Of course, living cost in the developing countries is much lower as well. 3) what applies to both the US and many developing countries is the level of minimum wage will have an impact on the business, especially those low-end labor intensive sectors. what is an appropriate level of “minimum wage” or whether government should set a mandatory “minimum wage” are questions currently under heated debate with divided views among the public. Hello! May I know the source of the wage data? One of the leading apparel brands suspects that the duty benefits from TPP would be offset by the raising labor costs in Asia, Vietnam in particular. Another data source predicts that Asia’s youth labor(upto 29 years age) shortages will worsen in the next 15 years; China would see a significant decrease in labor availability whereas India would see a significant increase; interestingly both countries are not parties to TPP or any other preferential trade agreement with US (although India is negotiating a preferential agreement with EU, which is taking for ever to conclude). thank you for the insights!! It is very interesting to be able to compare and contrast the minimum wages across many regions in Asia. It was also interesting to see how low of a minimum wage Bangladesh has compared to the other regions. This reminded me of the case study on the Rana Plaza tragedy and Bangladesh’s export industry—where we first gained insight into their low wages and more specifically how their low labor costs is their main competitive advantage, “set at roughly $37 a month”. This blog post has also made me curious what it is the other regions have to offer or vary in that has resulted in higher minimum wages and their growth of these wages. For Cambodia, the blog post discusses how one reason is due to local labor unions. This lead me to wonder what the reasons are behind Malaysia’s 24.4% growth rate of monthly minimum wages from 2015 to 2016. I wasn’t surprised to read in the blog post, “minimum wage in Asia remains a fraction of the level in the developed countries”. The stage of economic development in such regions compared to more developed countries is very different, as we have learned. Minimum wage is an important topic because it is an insight into that country’s economy. It is very interesting to see the differences in country’s minimum wages. While developed countries minimum wages are larger than others, it is not necessarily deemed unfair or bad, it just reflects a different type of economy when comparing countries. Since the minimum wage in developing countries is lower, this is why many US companies outsource to lower wage costs, giving them a comparative advantage in labor wages. When I worked for minimum wage when I was in high school, I was very excited to see it jump up a few cents while I was working, its all because the economy was doing better, a better supply and demand relationship. Do you think the minimum wage in the US will continue to rise?? Do you believe developing country’s minimum wages can increase in the near future? I agree, it is very interesting in seeing the differences in countries’ minimum wages. When I read “Asia remains a fraction of the level in developed countries” i couldn’t even image living on less than minimum wage. But do things cost less in Asia? It makes me think, why is minimum wage rising? And if minimum wage is rising, is purchasing power also rising? Or is the minimum wage rising because things are getting more expensive? Like the United States, minimum wage is more than what it was years ago. However, that same amount of years ago, $100 could buy you more things than $100 today can. Minimum wage is a topic that is repeatedly brought up and always causes debates. However, it is a good tracker of how an economy is doing. It is constantly rising and falling to adjust with the rest of the country. I find it interesting how one country can have a minimum wage as little as 25 cents an hour where in America it is found to be around $7.50. Do you think this is fair? Why or why not? I think it is interesting that although the minimum wage has gone through a drastic increase in some parts of China, and has not in others. I believe that this will cause business to move around to the areas of the country that offer the cheapest of wages. I think it is necessary that there be a sweeping change in wages, or else the companies that offer higher wages will not have business and have to go out of business and the members of the union will not have jobs. Reflecting on the similarities and differences of minimum wage in several countries is all relative in a sense. Comparing minimum wages is almost irrelevant when it comes to the actual dollar amount but is relevant when comparing the Textile minimum wages to the health and prosperity of the countries economy. Highlighting the growth rate of minimum wage allows you to see what countries economies are growing and which are declining. I would imagine that this is a key component of negotiating and renegotiating international trade policies and essentially keeping a “level playing field” across the board. good point! “minimum wage” can truly lead to public debate on “level playing field” in trade, which definitely is something critical to address. Remember in the class we mentioned creating a level playing field is one of the key objective of US trade policy. Minimum wage is definitely a topic that is very prevalent in today’s society. It is important to see the differences between each country’s minimum wages and be able to compare them. More developed countries have a higher minimum wage, and this is because of the types of economies compared to the least developed countries. Many United States companies outsource to lower wage costs which gives these countries opportunities for work and giving them higher labor wages than they would have without us outsourcing to them. The United States compared to Bangladesh is drastically different because they are a least developed country and we are a developed country for example. It’s interesting to see different points of view in regards to the topic of minimum wage, as US citizens protest and fight for higher wages of up to $14/hr, and developing countries are providing workers fractions of the $7 minimum wage we in America have today. I am a believer that all workers, wherever they are, should be able to work for a living wage, but I find that companies holding a lot of power can become the ones that exploit workers the most. I wonder if there was a way to restructure the business model of a retailer, in terms of changing their sales plans and margins so that the cost of labor could not stoop so low as to not being able to pay workers a living wage. Wage differences between countries are valid – especially when relating the wage to the lifestyle of a specific worker. The reason why US citizens are fighting for a higher wage, is because the cost of living is so much higher than what citizens can afford. Businesses should be reviewing developing countries’ wages the same way, giving labor workers enough to afford living in general. Until I really learned more about all the factors that contribute to a nations economic success, I rarely thought about the minimum wages for T&A factory workers abroad. As we learned, these minimum wages can fluctuate a little. It almost seems that whenever the minimum wage is really low somewhere such as Bangladesh, then more companies such as Walmart source products/apparel from there. Vietnam has a lower wage than India, China, etc. which makes it more competitive for factories, globally. It’s interesting to see where companies source from depending on factors such as this. Some U.S. retailers decide based on low costs, while other care about socioeconomic factors and would rather pay a little more to outsource. Since China’s minimum wage is growing do you think they will have a more premium brands looking to manufacture with them rather than lower end fashion brands? How exactly do you think the growing minimum wage in Asia will effect the fashion industry? Do you think Vietnam has enough labor to take over the fashion industry in the future? It is interesting to see how drastically different minimum wage is in different countries as well as in the same country but different regions within. It surprises me that it is possible for there to be a different minimum wage within the same country because in the US it is run by the government and is a nation wide standard. I think that India has the right idea about adjusting their minimum wage based on the economy’s GDP and inflation rate, to ensure that there is no drastic gap within the economy. Also, it’s nice to see that minimum wage is rising in so many countries because of how many people truly are working at minimum wage and trying to take care of a family. Despite the fact the wages are rising in Asia, they are nowhere near what the wages are in developed European countries and in the US. Do you think that the wages in Asia will ever rise to be equal to that of those in the US if the economies continue to grow towards becoming more developed countries? I wonder if the rising wages will end up hurting the workers in Asian countries more than helping them because comanies will simply chose to source labor from countries with cheaper labor. If companies choose to source to cheaper countries, then many factories will close down. I think it is interesting to examine the effects that a high or low minimum wage has on a country. In the United States the minimum wage is very high, relative to other countries because the cost of living is also very high. I think that major retailers that outsource to developing countries tend to ignore the “cost of living” factor when they consider sustainability practices. It makes sense why these companies outsource to developing countries because they are getting the lowest production costs but is it worth the cost of being ethical? It is a complicated issue because there are many people to blame when examining the minimum wage in developing countries. For example, you could blame the government in that country for not raising the minimum wage, but if they did than these major retailers would find another country to trade with and there would be thousands of apparel manufacturing jobs lost that would end up hurting these economies even more. Perhaps there could be a worldwide standard for minimum wages that would accurately determine what the cost of living would be for a particular country and set the minimum wage accordingly. This may be wishful thinking but it would allow for a more standardized minimum wage and it would force large corporations to pay higher costs for production and in turn create a better standard of living for many people. I find it incredibly relieving that one of the reasons why minimum wage was increased was due to labor unions. After looking at America and how the apparel industry changed from the Triangle Shirtwaist Fire and how labor unions greatly affected it, places like Cambodia are just now reaching that point. The Rana Plaza incident had similar affects. If we look at many LDCs that the textile and apparel industries dig for, not many of them have labor unions to start with. The T&A industry gives opportunity for GDP growth and economic growth for these countries and when they react with labor unions, it shows true progression. As discussed in the first Case Study, if government officials do not pass essential labor laws, who is then responsible for human rights? The brands that manufacture in the companies? Consumers? Minimum wages has always been a controversial topic when it comes to the discussion on global trading issues. However, I do not think that comparing the minimum wages in different countries using U.S. dollars is a good way to reflect the real situation, it is because different countries have different living standard and price levels. But I think that having increase in minimum wages is a good news for all the workers and should be maintained. As mentioned in class, in some way, the problem of having extremely low wages was caused by global trading, because the international companies have always been searching for lowest wages labour for production in order to maximize their profit. This situation led to tragedies like the Rana Plaza Accident and workers were not protected. Therefore, I do think that minimum wages is a topic that we as consumers should be aware of. Hello, the data is from the China Chamber of Commerce for Importer and Exporter of Textiles and Apparel ( http://www.ccct.org.cn/Pub/S/1505/223973.shtml). I also consulted other sources such as ILO, just-style and Sourcing journals and the numbers look reasonable. I think we need to link productivity and minimum wage somewhere. Agree! Econometric evidence has regularly shown that labor productivity alone explains about 70–80 percent of the cross-country variation in average wages in manufacturing. The cost advantage of low wages is generally offset by the cost disadvantage of low productivity. This implies that unit labor costs are roughly comparable across countries. For more discussions, here is a book, which I really like: Irwin, D. A. (2015). Free trade under fire. Princeton University Press. What are the projected rates hourly/month garment workers rates in 2018 of China, Taiwan, Vietnam and India ? I am hearing so much conflicting information of of China and Vietnam right now. It’s so interesting to compare minimum wages in LDC’s compared to the wages we receive here in the U.S. and to think about how unhappy most people are with the amount. I believe it was not long ago when citizens were protesting in many states demanding that the rate be raised an exponential amount. This really gives an insight to different cultures and what people are willing to accept for so called “undesirable jobs” compared to people who will accept anything to make a living and just because their lives or families depend on it. It’s also good to hear that many of these wages in LDCs are rising because as FASH students we know how hard these individuals work to make the items we love and use everyday, and they often do so for less than they deserve in unsafe conditions. It’s exciting to know that reform is occurring and these employees are getting closer to being properly compensated for all their hard work and dedication. LDC countries offer their cheap labor force to help their economy barely since they do not have their technology or other attractive industries to exchange the wealth. However, they need to fight of increasing the minimum wages for their citizens. Otherwise, they will loose in the global trade. From this article, the asian countries is increasing the minimum wages but the gap of minimum wages among Asian manufactories are widening. As the article mentioned that Indonesia could not catch other countries’ steps, which is tragedy in the globlization. I wonder if there could be a comparison between the minimal wage and the cost of living. We had the Founder of Bombchel Factory speak to us in our Social Entrepreneurship class at Georgia Tech and she mentioned how although the wages are much lower in Liberia, it still equates to a much higher standard of living with the money. It would be really interesting to see what the proper wage should be provide enough support and a sustainable life for the garment workers and their families. I think it is incredibility important that Asia is facing a 5% minimum wage increase. There are so many countries in Asia that contain thousands of factories and hundreds of thousands of workers everyday. These workers are paid little to nothing in order for cheap labor to benefit big companies. As noted in the text, in Cambodia the increase in wages is mainly because its being pushed by labor unions. Labor unions are so crucial for employees to assure they get treated and paid the way they deserve to be. Although Asian producers are making slight increases in comparison to the US where a worker monthly earns no less then $1,200, Asia company employees are making less then half of that. Doing intense labor everyday all day for little to no pay out is a huge problem we face today. I think that these companies are making moves in the right direction to pay their employees the amount that they should be but they need to continue to rise the minimum in order for employees to have the opportunity to support themselves and their families. After reading this information I’m shocked at how little minimum wage is in developing countries and throughout China. They amount of labor, long work hours, and working conditions these human beings endure is astonishing and their pay should reflect the work they put in. The increase in minimum wage for Asia is long overdue in my opinion, and should be reviewed consistently. It’s interesting to see these pay rates because the minimum wage in the United States is very high in comparison no matter which part of the country you look at, but does it not equal because of our high cost of living? It would be interesting to see the cost of living of a factory worker in the US compared to a factory worker in Bangladesh or Asia. With Asia’s rise in minimum wage do you think US brands that source from China will start to look for a cheaper alternative?